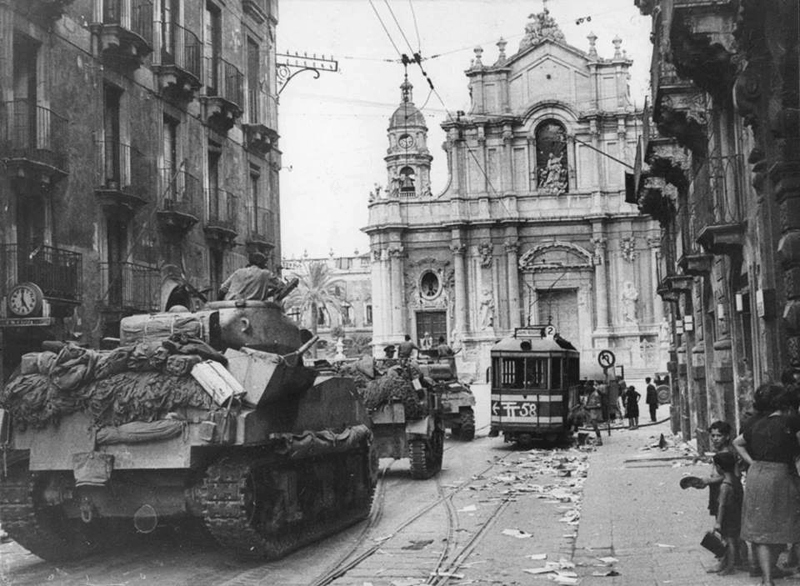 Allied soldiers in the center of Catania at the Piazza del Duomo, Sicily during Operation Husky, in 1943. The Tiger was one of the most feared German tanks of the Second World War. Heavily armoured and fitted with a powerful 88 mm gun, few Allied or Soviet tanks were a match for it in open combat. This example was knocked out at Belpasso in Catania during the Allied invasion of Sicily. Creator: Major W H J Sale, MC, 3rd/4th County of London Yeomanry (Sharpshooters). Universal carriers of 2nd Wiltshire Regiment pass through Trecastagni, 9 August 1943. The image is not taken in Pedara as stated with the old image but in Trecastagni. Knocked out Mk VI Tiger tank at Belpasso, Sicily 1943. Operation Husky, the Allied invasion of Sicily. US troops drive along the ruins in Piazza S Martino in Randazzo, Sicily 1943.